Just wanted to take a moment and reflect on this day eight years ago. Some people remember the bombing of Pearl Harbor, some people remember the day Kennedy was killed. 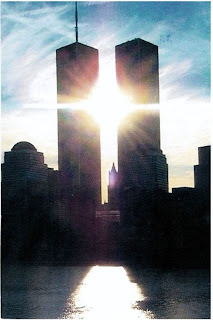 This generation will remember the day the twin towers fell. I will always remember what a great country we live in. A country that lets us choose where we go to school, where we worship, where we live, who we marry, and even who our leaders are. We may never all agree on everything, but we know that in this country, that is ok! To those that lost family, friends, neighbors, let us forever honor their memory today. To those that lost their lives trying to save others, let us forever honor their memory today. To those that continue to fight for the freedom that the rest of us cherish, thank you! May you be able to some day know that you are our heroes.